In fact, the Basic Service might be all you need if you're a freelancer or solo-entrepreneur. For larger businesses who want to get to know how our system works, it's also a good way to try it out without having to make any changes to your existing phone system. 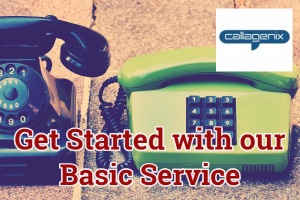 What is the Basic Service and how does it work? Well, it doesn't get any simpler than this - it's just a call divert from your chosen Callagenix number to any existing UK landline. You can select any 08 or 03 number from our wide range of available numbers. The ranges covered are 0800 numbers, 0844 numbers, 0845 numbers, 0870 numbers, 0871 numbers, 0872 numbers and 03 numbers. Businesses will be able to choose an 0333 number, whilst registered charities/non-profits can select an 0300 number. Once you have selected your new number, you then need to type in the destination number for your calls - i.e. the landline number you want your calls redirected to. Your Callagenix number is cloud based and sits on top of your existing number, which is not affected in any way. When somebody dials your new number, the call will be redirected to your existing number and your phone will ring as normal. if you ever want to redirect your calls to a different UK landline you can do so by logging into your account and entering the new destination number. All changes are free and virtually instantaneous. What it costs you depends on the number range you choose and/or the number of calls you receive. If you choose a number starting 084 or 087 there is no cost to you at all. In fact, you may even earn some money if you select one of the revenue generating ranges. The only exception to this is the 0870 number range, where there is a small incoming call charge to be paid. If you choose an 03 number or an 0800 number there will be a cost involved for you to cover incoming call charges. 0800 numbers are free for the caller, which means you pay the whole cost of the call. 03 numbers are the non-geographic equivalent of regular 01/02 numbers. The cost of the call is split between you and the caller for 03 numbers. In both cases, we have a range of call bundles available to keep your costs low. For details see the 0800 call bundle page, the 0870 number call bundle page, and the 03 call bundle page. What if I want to do more than just redirect my calls to a landline? That's where our range of Advanced Services come in. These services give you many options and allow you to create the ideal phone service for your organisation. For example, you could divert calls to mobiles, set up a virtual switchboard, use our Answerphone service, use our Group Divert service to a team and MUCH more. You can also choose from any of the number ranges we offer (with multiple numbers if required), use our business-grade VoIP service to make outbound calls and send out bulk SMS messages. Whether you require something simple of more sophisticated, we can help. Why not choose a number and get started with a Basic Service today? Or else you can contact us if you would like our advice on creating a system with more features.